Ebola has not only caused a medical emergency in West Africa, where the disease broke out, but has also affected the livelihood of millions, especially in Guinea, Liberia and Sierra Leone, the three worst-affected countries. The most vulnerable have been the poor, particularly women. According to the World Bank, nearly half of Liberia’s workforce has not been working since the start of the disease in December 2013. “Even those living in the most remote communities in Liberia, where Ebola has not been detected, are suffering the economic side effects. Relief efforts must equally focus on those in the poorest communities for whom market access, mobility and food security continue to get worse,” says Ana Revanga, a senior director at the World Bank Group. Existing problems, such as those related to food prices and food security, have only worsened. A press release by the World Bank states that Liberia has witnessed a spike of 40 per cent in imported food prices. The World Bank is mobilising close to $1 billion to help the countries hardest hit by the crisis. World leaders came together at a session hosted by the United Nations Development Programme (UNDP) to analyse challenges and opportunities to tackle the spread of Ebola. Government representatives from China, Cuba, the Gambia, Nigeria, the Russian Federation, South Africa and Uganda advocated for a response that focuses on long-term solutions to reduce vulnerability to such crisis. “We have to understand that the socio-economic impact of the disease will continue long after Ebola,” Ruby Sandhu-Rojon, deputy director in the Regional Bureau for Africa at UNDP, told participants at the session. Intergovernmental agencies, think tanks and private sectors stressed an integrated response to Ebola, focusing on the linkage between poverty and epidemics. 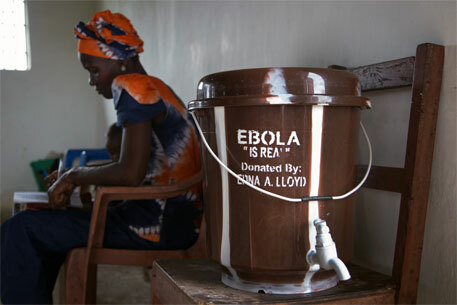 In an effort to find speedy and effective treatment for the Ebola virus, the Bill and Melinda Gates Foundation has pledged to donate US $5.7 million to increase the production of experimental drugs in the affected countries. There is currently no licensed vaccine for Ebola, which has killed more than 5,000 people, almost all of them in Africa. According to a BBC report, the programme will identify treatments based on the blood of Ebola survivors. A Spanish nurse, Teresa Romero, was cured when she was given the blood of another survivor, a nun from Liberia. Apparently, the antibodies produced in the blood of patients to fight off the Ebola virus could be transferred from a survivor to a sick patient to boost their immunity. Recently, the World Health Organization had proposed that the blood of affected people should be used to treat the disease. The Foundation, headed by former Microsoft boss Bill Gates and his wife Melinda, will work with several private partners to develop plasma treatments. “The Gates Foundation is focusing its R&D investments on treatments, diagnostics and vaccines that we believe could be quickly produced and delivered to those who need them if they demonstrate efficacy in stopping the disease,” BBC quotes Papa Salif Sow, an infectious disease expert working with the Foundation.